You’ll notice that in many captions below I make mention of the sitting or reading areas. The reason for this is that adding this feature to your master bedroom interior design not only offers additional use for your room, but it creates a more luxurious space. If you’re looking for a great way to lounge comfortably in your bed – check out our bed lounger review (we’ve had one of these for 5 years). Black predominates this bedroom design with spashes of white and dark taupe. Black four poster bed is the star of this bedroom situated on a white and black rug. Small sitting room off to the side. 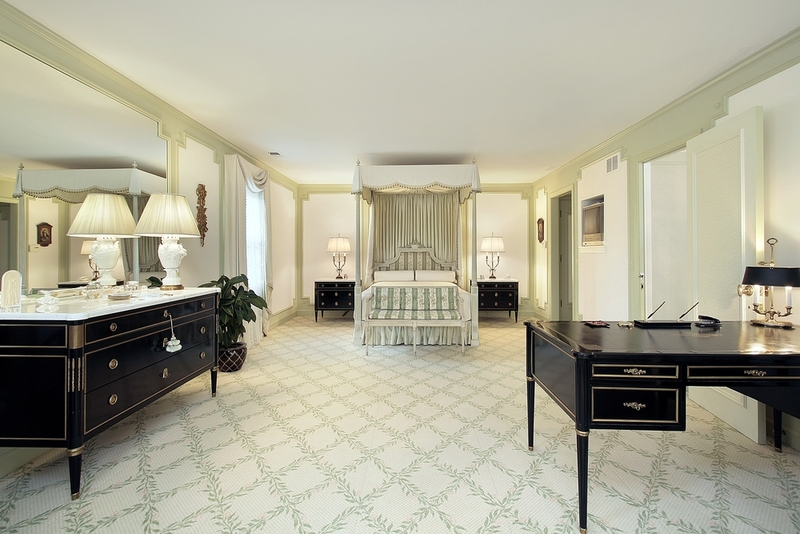 Large ornate bedroom in white, mint green and dark brown. Canopy bed is on one end with large dark brown vanity and desk on the other end. Masculine bedroom design with dark wood ceiling, four poster wood bed and dark brown carpet. Reading chair with table in the corner with bench at the foot of the bed add comfortable seating to this room. Large master bedroom in luxury Southwest home. Southwest design scheme throughout with exposed wood beams, adobe appearance, wood floors and arched windows with iron inlay. 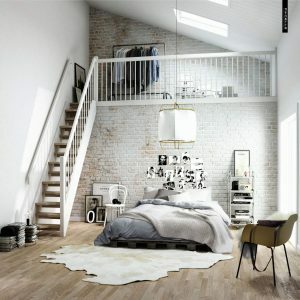 I particularly like this room because of the two distinct areas making it a functional space (in addition to sleeping). Large bedroom with integrated color scheme of earth tones. Ceiling has exposed wood beams. Four poster bed matches night stands and bench at the end of the bed. L-shaped sofa makes up the seating area on the other end of the room. 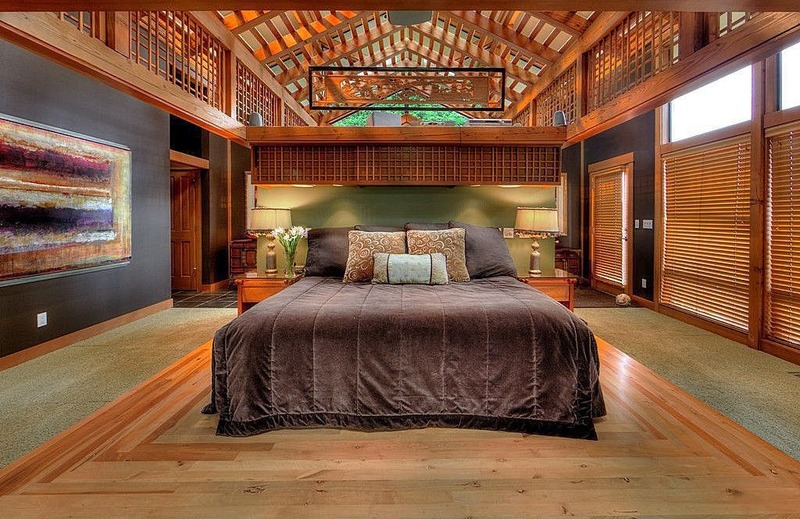 Enormous master bedroom with extensive wood paneling with matching custom bed. Partition wall with fireplace creates separate sitting area. Small office area off to the side next to the door leading to a private balcony. Large ornately designed master bedroom with separate living room. 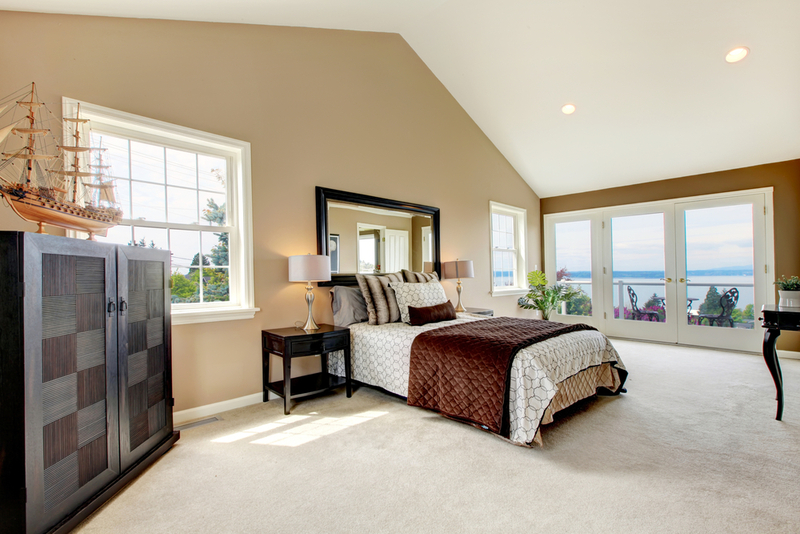 2-room master bedroom in brown color scheme. Bed with end-bench in one room. Office with fireplace in adjacent room accessed via arched door. 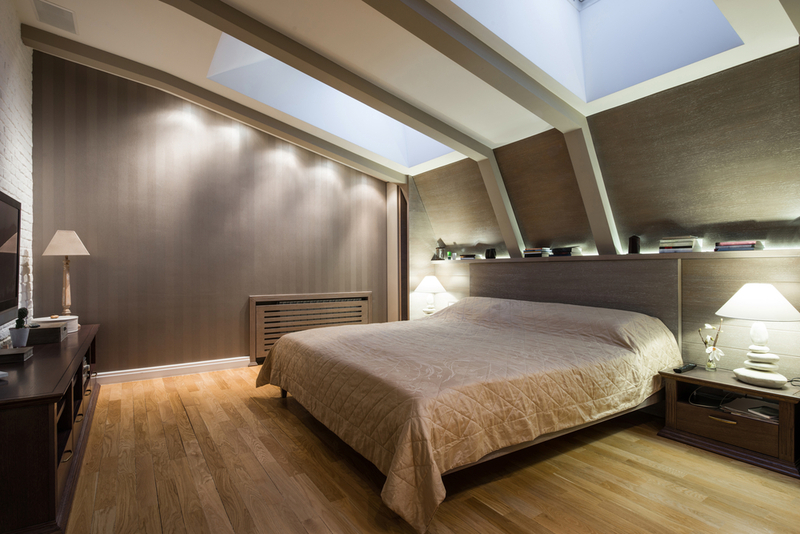 Modern bedroom with two skylights on sloped ceiling. This bedroom showcases a minimalist design enhanced with sloped ceiling and large skylights providing plenty of natural light. Hardwood flooring is so versatile, it can literally be used in any room of the home! 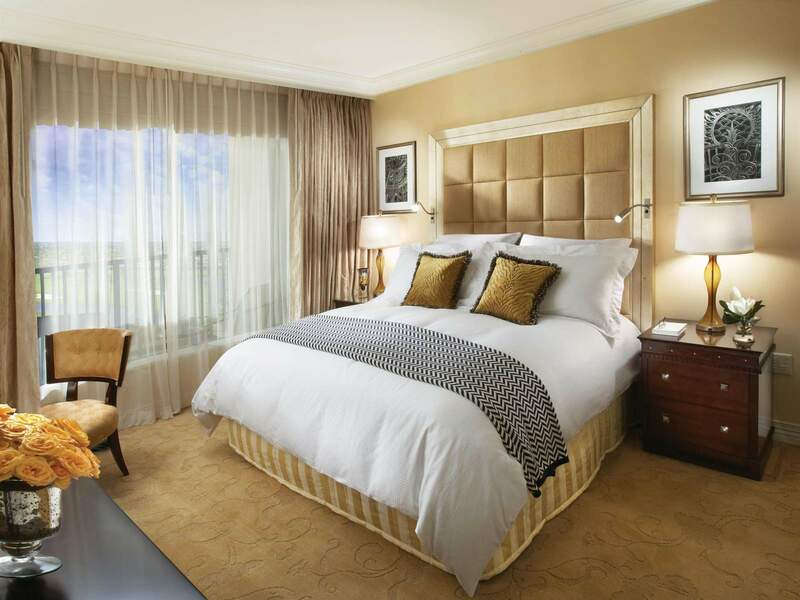 Luxury bedroom with fireplace, TV, balcony access with city views and large wood bedroom furniture. This bedroom uses space well by creating a small sitting area at the end of the bed with a loveseat and coffee table. Small vanity with mirror off to the side. Color scheme brought together with rug under sitting area. Master bedroom with adjacent nursery. Room color scheme in various shades of purple. Arched doorway leads from the master bedroom to adjacent nursery. Small sitting area at the head of the bed with two reading chairs. Large L-shaped master bedroom design with four-poster bed, beamed ceiling, large sitting area and a day bed all in white and light beige. Cheerful bedroom design in yellow, white and earth tones. Custom yellow bench at the end of the bed opens up to a small sitting area with two arm chairs and small coffee table. Yellow color scheme is toned down with black night stands. Exterior wall contains full-width windows with drapes. Small master bedroom in green, cream and brown color design. Brown suede bench at foot of bed opens up to reading chairs. Open doorway leads to en suite bathroom in same color scheme. Moderately sized master bedroom in Southwest design. The four poster bed is situated in the center of one wall with a small reading area opposite. 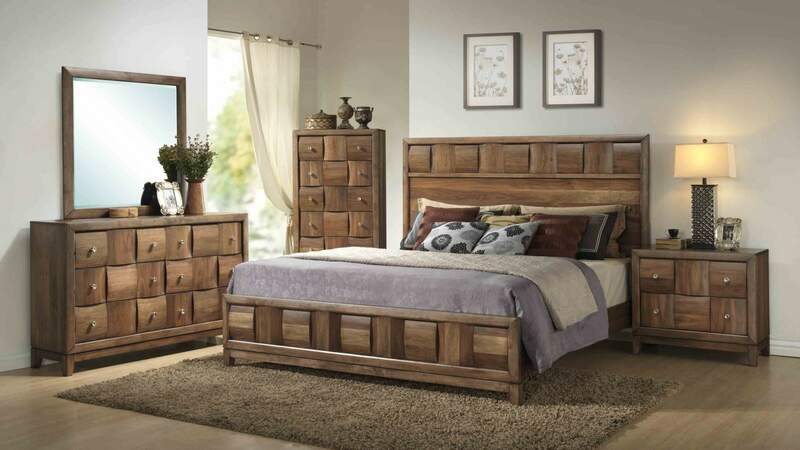 A wood chest sits at the foot of the bed offering storage and a sitting bench. Arched windows line the exterior wall. Cavernous master bedroom with cathedral, wood beam ceiling, partial hard wood floor and extensive wood lattice throughout. Spacious and minimally furnished contemporary bright bedroom. The star of this room is the bed followed by the large arched window providing unobstructed view of a lake. Small master bedroom as luxury goes, yet the attention to detail in design qualifies this bedroom for this luxury bedroom gallery. The multiple earth tones blend well throughout the room including wall art, paint, carpeting, bedding, pillows, reading chair, plants, furniture and carpeting. Feminine master bedroom design with floral billows and art. Wood ceiling beams provide a textured ceiling. Ornate reading chairs with round wood table create a small, yet functional separate reading and sitting area within the room. Modern spacious master bedroom design with extensive city views, floor-to-ceiling windows, small sitting area and large screen television mounted above a small gas fireplace. The padded wall panels are what stands out in this bedroom design which span the entire wall against which is the bed. A loveseat is situated in the bay window area. Plants throughout the room create a fresh appearance. 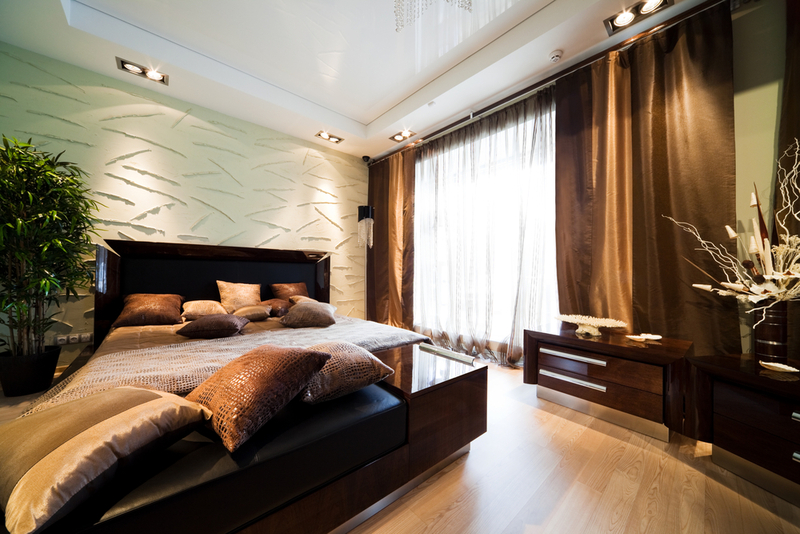 Modern bedroom design in grey and, white and various shades of brown. Gas fireplace opposite the bed create warmth that most modern designs lack. The room includes a small sitting area before the door to the master bathroom. 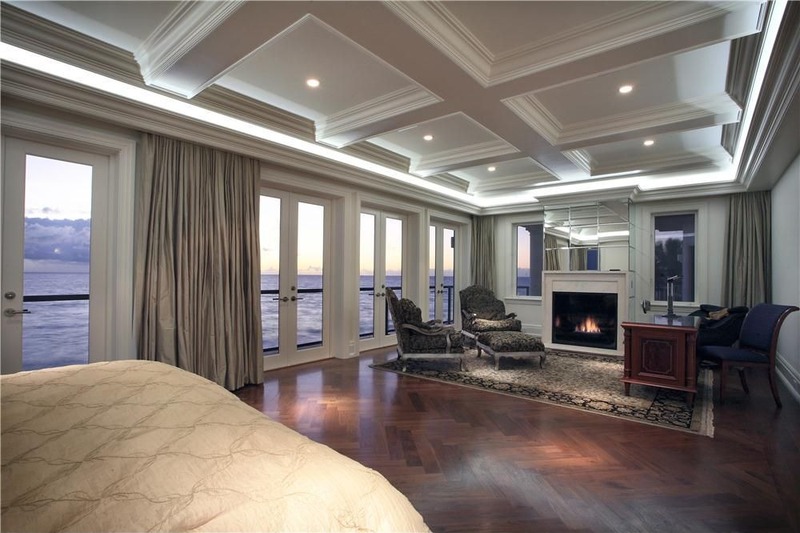 Spacious master bedroom with multiple glass doors leading to balcony overlooking the water. Bedroom includes reading area and desk adjacent to a fireplace. Contemporary Southwest design in this room starts with the large four-poster bed. Bed-width padded bench at the foot of the bed continues this themed room. To the side are ornate sitting chairs with a barrel-like table. Where this bedroom lacks in size, it makes up for in design and attention to detail. We included this room in our luxury bedroom gallery because it’s an excellent example of how to design a smallish master bedroom and make it look luxurious with minimal cost. Another small master bedroom expertly designed creating a luxurious bedroom environment. Dark browns and black often add a richness to a room and it certainly does here. The padded wall adds texture to the room along with the hanging chandeliers. This moderately sized master bedroom has extensive design details including patterned wood wall above the bed, chandelier, small sitting area, white carpet. Bedroom includes doors to private balcony. 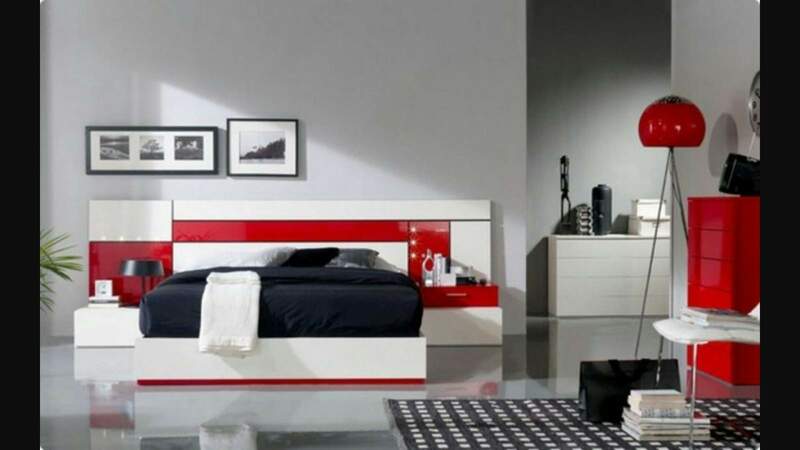 Plain bedroom turned into a modern design with carefully selected bedroom furniture. The large wood square-framed bed forms the centerpiece in this room. The modern lounge chair and matching nightstands continue to enhance the room’s design. It’s all brought together with the three-toned paint job on the walls. Spacious brown and white bedroom. Dark wood floor starts off the brown color scheme and is continued with the dark brown four-poster king-sized bed. Lower half of the wall is in white paneling which lightens up the room. Tray ceiling gives the appearance of more space. Size, view and cathedral ceiling make this bedroom. Double glass doors lead to private balcony overlooking the ocean. The room has plenty of space for a small sofa and chairs (which is what I would add immediately). 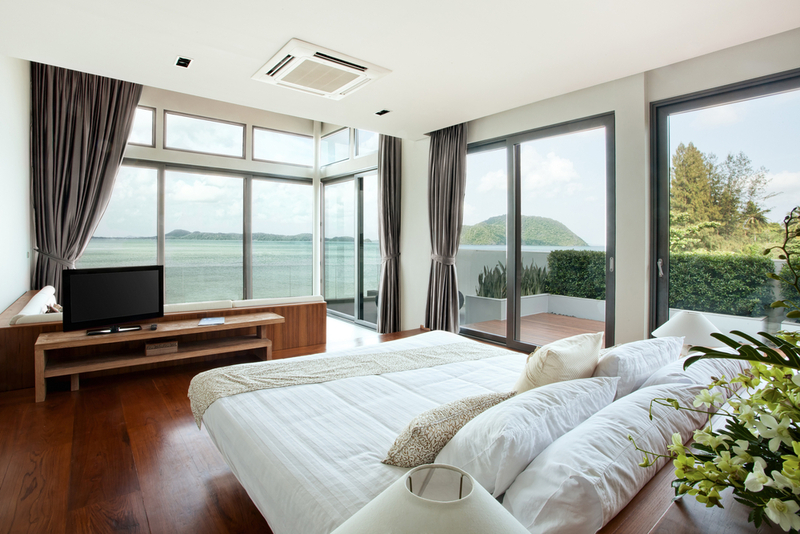 This bedroom is designed to take full advantage of the million dollar view of the ocean. Bedroom includes sliding glass doors to large patio overlooking the ocean. The room itself is minimally furnished containing a bed, TV and built L-shaped sofa. Massive is the main descriptor for this master bedroom. This bedroom is larger than many apartments. It contains 2 sitting areas, two walls with extensive windows, a cathedral ceiling in white and large white fireplace with a mirror above it. Large bright master bedroom that takes up the entire top floor of this luxury home. The bedroom is accessed via winding stairs. At the top of the stairs is a partition wall containing a fireplace and television which faces the bed. A large bay window houses a sofa and chairs. Bedroom looks out onto the backyard swimming pool. Dark and textured is what this bedroom is all about. Despite a white wall and white tray ceiling, this bedroom gives off a dark design with dark wood bed, bench, furniture, drapes and wood flooring.